Dimensions 49'0" by 37'8" by 14'8"
Power plant 1 825 hp (615 kW) Bristol Perseus VIII nine-cylinder radial driving a three bladed propeller. 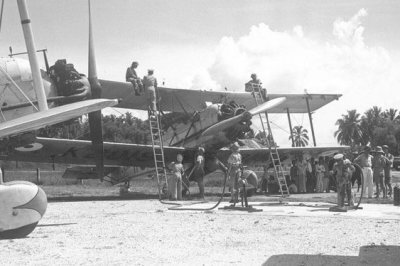 Variants The Vincent was a variant with a larger fuel capacity used as an Army cooperation aircraft. The Vildebeest was a biplane torpedo bomber which had the distinction of being even more obsolete than the Swordfish. It was present in some numbers in Malaya in late 1941, mostly because it wasn't wanted anywhere else. The design dated back to the late 1920s, the prototype flying in April 1928 and the first production aircraft being delivered in November 1932. A small number went to Spain. The Vildebeest was the only torpedo bomber in RAF service when war broke out in 1939, illustrating the shocking neglect by RAF of its Coastal Command. All those operating in the Far East were lost by March 1942. A few continued patrols from Ceylon until August 1942.